The town of Kurram Agency, near the Pakistan – Afghanistan border in the Khyber Paktoon Province is a hotbed of terrorist activity and also a major market center. Syed Mehdi Hussain, 20, plied a taxi during the day and went to a night school. On the evening of February 18, 2008 Hussain was driving in the crowded narrow lanes of the Para Chinar Bazar of the Eidgah market, when a suicide bomber detonated a powerful explosive that killed 64 and injured over 200 people. Hussain was thrown out and his taxi totally destroyed, burnt to cinders. He was seriously injured — broken ribs, punctured lungs and multiple fractures in his right hand. Both his eyes were severely damaged. 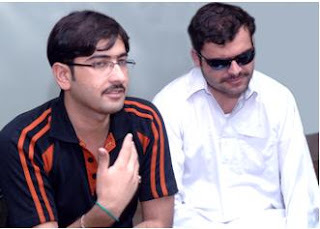 Blinded and broken, Hussain spent almost 3 months in intensive care at a hospital in Peshawar. Back home, he was practically blind and had to depend upon others in his day-to-day life. Hussain's father is a farmer and his parents could not do very much more for their son. Despite promises by local politicians, he did not receive any government compensation. In March 2009, he underwent a surgery in his left eye. Through the efforts of relatives and friends, he moved to Islamabad, where the Al Shifa Trust took up his case. A friend, Adil Raza scoured the websites of eye hospitals all over the world and came upon the LVPEI website. He started corresponding with LVPEI over six months ago and doctors at LVPEI readily agreed to take up Hussain's case. Hussain and his cousin Irfan Haider flew into Hyderabad on September 21, 2011. Hussain was seen in the clinic by both our cornea and retina specialists. On October 10, 2011, he underwent a complicated combination surgery in his left eye, for his retina and to place the Boston K-pro as an artificial cornea. He did well post-surgery, regaining ambulatory vision. On October 24th, he underwent another surgery by a glaucoma specialist to place the Ahmed Glaucoma Valve (AGV) to ease the intraocular pressure (IOP) build-up in the eye. Post-operative, his IOP was within normal limits. Hussain returned home happy that he could now see well enough to be independent in his daily life. He was grateful to the doctors and the staff at LVPEI, who were extremely supportive and also subsidized his treatment costs. 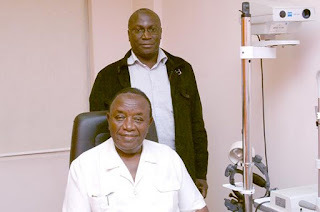 The Honorable Mr Henry Muganwa Kajura, Deputy Prime Minster of Uganda flew into Hyderabad on March 22, 2011, hoping that his eye problems would be solved at LVPEI along with his physician Dr Tendo Nsereko. Henry Kajura has served in the government since 1989, the last 10 years as Deputy Prime Minister. Mr Kajura had a macular hole in the retina in the right eye. He was seen in the clinic by our retinal specialists and scheduled for a vitreo-retinal surgery in an attempt to close the macular hole. The operation was successful! Mr Kajura came to LVPEI a few months later for the removal of the silicone oil. Post-surgery, a fundus examination showed his attached retina with the hole in the right eye closed. He commented, “I am very satisfied with the treatment and the professional way I was taken care of at LVPEI.” In a meeting with Dr Gullapalli N Rao, Chair, LVPEI, he expressed a wish to set up a similar institute in Uganda. We at LVPEI pride ourselves in our ability to not only provide successful treatment, but also inspire people for similar vision as well. Her head covered with tiny tight curls, little Ofure Shalom clings to her daddy’s neck, lost in a world of her own. She is thousands of miles away from her mother and sister and her home in Benin City, Edo State, Nigeria — coping with strange faces and unfamiliar food. Her thick glasses and a ear (cochlear) implant tug at your heartstrings. Her parents first brought her to LVPEI in 2009 as a baby, seeking treatment for her opaque corneas (congenital corneal opacity) and a hole in her heart. It was a hard time when the parents discovered that doctors in Nigeria would not perform a corneal transplant on a baby with a heart condition. A glimmer of hope came in the form of a Nigerian doctor who had trained at L V Prasad Eye Institute. She suggested they rush to Hyderabad — the baby was already 5 months old and time was of the essence…they had to move fast. But a trip to India was far beyond their means. Family, friends and the church helped, the couple also approached banks for loans. Just when things were falling in place, little Ofure suffered a congestive heart failure and was hospitalized for 2-3 weeks. Finally, armed with oxygen on the flight, they arrived in Hyderabad in September 2009. Ofure would need cardiac surgery, but she was too small, recalls her father Martin Okhawere, a public health specialist in the University of Benin Teaching Hospital in Nigeria. They tried to feed the baby as much as possible and prayed and finally she gained a kilo! The doctors were amazed and Little Ofure underwent the life-saving surgery at a specialty hospital in Hyderabad. At L V Prasad Eye Institute, it was a challenge for surgeons to perform corneal transplants in the baby’s eyes. After a careful examination and review by the doctors, Ofure successfully underwent corneal transplants in both her eyes, opening her windows to the world. 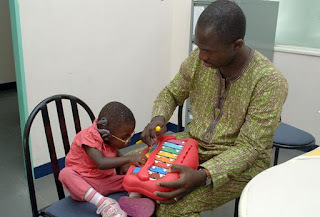 Back home in Nigeria after 4 months, she remained under the care of an ophthalmologist formerly trained at LVPEI.